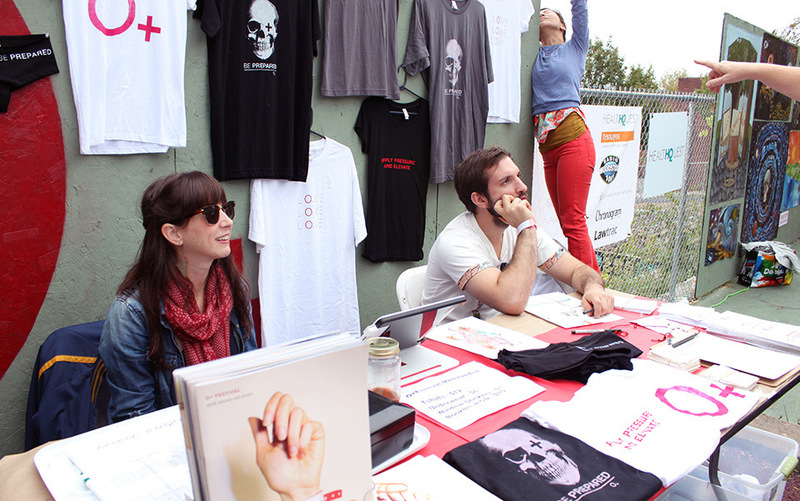 At the O+ festival, musicians and artists barter their talents for medical care. A new social contract in action? is a freelance science writer and the author of The Philadelphia Chromosome (2013). She lives in New York. At a former hotel in the upstate New York town of Kingston, the makeshift clinic was handling a steady stream of patients. In what was once a lobby, volunteers sat behind long tables to welcome people and guide them to their appointments. Down the hall, in the old ballroom, doctors and nurses checked blood pressure, hearing, vision, and conducted other general health tests. Office dividers separated the practitioners, the appointments made private by shower curtains drawn across the openings. Some clinicians had examination tables, others conducted their exams in chairs. Behind the curtains, doctors listened intently to their patients. The mood in the clinic was casual and unhurried. Some patients carried musical instruments with them, guitar cases knocking against their hoodies and worn-in jeans, a quirky trimmed moustache here, an ironic T-shirt there. People stopped to talk with each other, conversations that frequently ended in hugs. My son coloured his drawing in the corner, no one minding that they had to step over his legs in order to reach the check-in desk. This scene was not part of the aftermath of a storm or other emergency (it was early October and Hurricane Sandy was still weeks away, its epicentre far from Kingston). The clinic was the heart of the O+ Festival, a three-day event during which musicians and artists barter their talent for medical care, and where medical professionals barter their skills in exchange for the music and art. But as my children and I ambled through the festival — past music venues, a clinic, a well-meaning (if somewhat pamphlet-heavy) public health expo, and along walls covered with art — it was hard not to wonder: is this the future of health care, or one more desperate attempt to cope with a severely broken system? Headlining musician Richard Buckner of Kingston received $700 worth of dental work at the O+ festival. Situated on the West side of the Hudson River, Kingston is a struggling industrial town resuscitated in recent years by a growing influx of weekenders, with new restaurants, bars, and shops now lining the main streets of its uptown neighbourhood and downtown waterfront. A town of approximately 25,000 people located about 90 miles from New York City, Kingston has also been revived by the continuing diaspora of artists and musicians who end up leaving the city neighbourhoods they’ve made hip and thus unaffordable. The town has become a haven for the artistically inclined who want to be close to the city without being punished by it. Kingston also has plenty of people without health insurance, which mirrors the US situation at large. About 49 million people across America are uninsured — or about one in six of the population. The problem stems largely from the expense of coverage: 41 per cent of these individuals live below the federal poverty level, which is an annual income of $11,170 for a single person, or $23,050 for a family of four, according to the Kaiser Family Foundation’s Commission on Medicaid and the Uninsured, published in September 2011. Many of America’s uninsured are part of the independent workforce. This broad category, comprising about 42 million people, encompasses much of the service industry, contractors, and temporary workers, and anyone who works as a self-employed freelancer, as most full-time artists and musicians do. For these workers, health insurance, which must be purchased independently, is simply too expensive. A basic coverage policy costs at least $200 per month, an expense that is too great a sacrifice for, say, a full-time musician with an annual income of less than $20,000 per year. A 2010 survey by the Future of Music Coalition found that, among 1,451 respondents, 33 per cent did not have health insurance, twice the national average. ‘The results indicate that those respondents who invest more time in their craft are less likely to be insured,’ the report stated. It’s all too easy for freelancers to find themselves in the twilight zone — not quite poor enough for Medicaid, unable to afford private health insurance, and with no prospect of an employer health care scheme. Courtney Hechler and Andrew McNay of Brooklyn traveled to Kingston to volunteer for the festival. For a freelancer who does buy health care, the plan might have co-pays (a contribution paid by the patient at the time a service is rendered) or deductibles (an amount that the insured must contribute before benefits kick in) that are so high that the monthly payments become pointless. On my way through the festival, I met Samantha Levin, a Brooklyn-based arts administrator who produces and curates exhibitions and does her own multimedia installations. She pays about $230 per month for a plan that includes a $1,500 deductible. ‘It’s the cheapest I could find,’ she told me, ‘but I’m never going to meet my deductible unless I get really sick’. The result is a population of artists and musicians who never visit the doctor, let alone have their teeth cleaned, because the out-of-pocket costs are too high. The demographic skews towards the young, which means that health issues are, on average, fairly manageable. But it also means that preventive measures are not taken, emergency hospital visits are more likely, and general, overall care is not being received. TThe initial spark for O+, which began with the Kingston-based dentist Thomas Cingel, had little to do with such concerns about the injustices of the US health care system. ‘I just wanted good music to come to Kingston,’ Cingel told me. 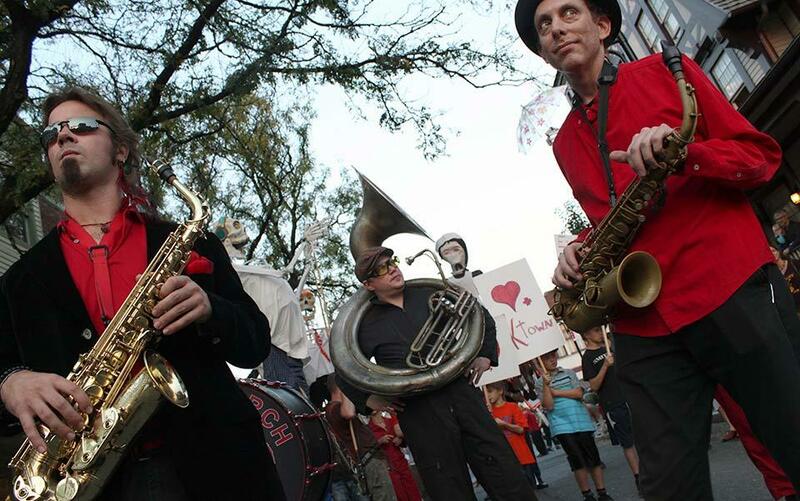 After seeing the band Monogold perform at a music festival in the Catskills in 2010, Cingel called the band’s manager to offer the musicians free dental care if they’d come to play in Kingston. It was a remarkable, inventive attempt at bartering, and it worked. The Kingston-based painters Joe Concra and Denise Orzo (who are married) and their friend, Alexandra Marvar, who works as a photographer, web designer, and writer, heard about Cingel’s bold idea. Between them, the notion quickly became more than a way to get musical acts to Kingston. Marvar was in a band at the time — she sang, and played a metal bucket — and knew plenty of musicians without health insurance. Concra and Orzo, fixtures in the Kingston arts community, knew that many of their friends had inadequate health care. Bartering seemed like an ideal way for musicians and artists such as themselves to exchange their art for health care. Over late-night discussions, the idea grew into a plan for a three-day festival. Concra called his friend, Art Chandler, a medical doctor whose job is to manage patients moving from the emergency room to inpatient care at Columbia Memorial Hospital in Hudson, about an hour away from Kingston. ‘Utter elation,’ is how Chandler described what he felt when Concra approached him with the idea for the festival. ‘Everything that is important to me rolled into one.’ So Concra asked Chandler whether he knew other doctors who would be interested. Six months after Cingel’s offer of dentistry for music, in October 2010, Kingston had its first O+ Festival. Monogold and dozens of other acts performed. That first year, the organisers produced 800 wristbands, all-access passes that could be bought by the general public for a suggested donation of $40 per person. ‘We were crossing our fingers to sell 50,’ recalls the photographer Marvar. The wristbands (hospital bracelets, naturally) ran out by the middle of the second day. The festival also brought three days’ worth of business to the participating venues, many of which struggle to stay afloat, fulfilling the team’s goal of supporting local businesses during the event. The second year, health care professionals provided more than $56,000 worth of care, all for no charge. 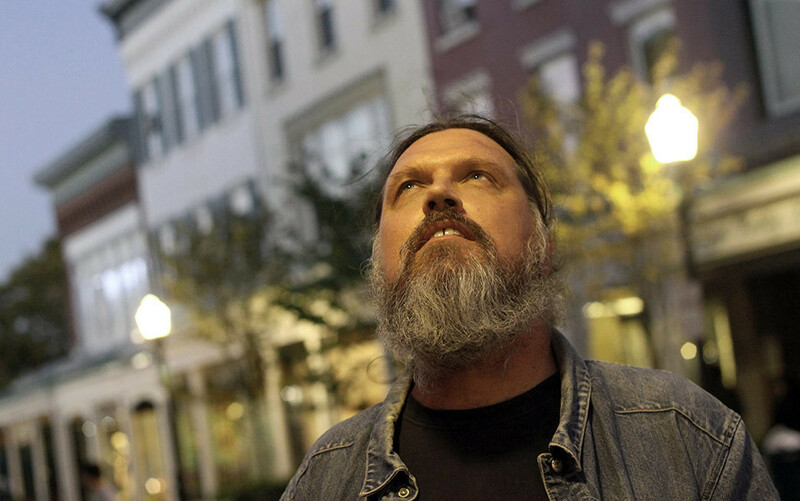 In 2012, Chandler was invited to speak about the festival at a TEDx conference at Lafayette College in Pennsylvania. The core team also spoke at the annual meeting of the Society for the Arts in Healthcare at the Children’s Hospital of Michigan in Detroit. By the time they were planning the third festival, Concra, Marvar, Orzo and Chandler were hearing from people in Nashville, Tennessee, and Norfolk, Virginia, about holding their own O+ Festival. From a simple offer of service for service, they were now tackling the nitty-gritty of forming a national not-for-profit organisation. Before we made our way to the clinic, my children and I had already spent time on the Art Bus, a mobile art studio that, when it is not parked in Woodstock, New York state, is driven around the Hudson Valley by an exuberant hippie couple offering printmaking and other crafts to young and old. We’d also been to a Ratboy Jr show, where my children, aged six and three, danced around to the duo’s songs about breakfast options and a robot who thinks he’s a pirate. We’d walked up and down the farmers’ market several times, eventually settling on paella for lunch, and been helped by the singer from Ratboy Jr in our frantic search for ice after my daughter was stung in the neck by a bee. Members of Brooklyn’s The Hungry March Band gear up for the parade. By the time we got to the old Dutch-style hotel, clouds were gathering, and photographers came into the lobby to cover their cameras in plastic. Down the hall from the converted ballroom, a psychotherapist offered counselling sessions. Illya Szilak, a volunteer doctor, told me that she had referred one of her patients to the therapist, but only after an hour-long consultation, a luxury she wouldn’t have in her everyday practice. After the festival, the patient will be able to continue with low-cost visits to the therapist. ‘That’s a possibility of materially altering someone’s life,’ Szilak told me. In 2011, she saw an asthmatic musician who, because he was uninsured, didn’t have any medication. He told Szilak how, months earlier, he’d been rushed to the hospital emergency room to treat an attack that was brought on by a winter illness. Szilak spoke with her patient about what triggers asthma and the importance of getting the flu shot, and prescribed him an inhaler. The care won’t just save money for the patient, said Szilak, but also for taxpayers. US hospitals receive billions of dollars from the federal government every year to help people without insurance. A 1986 US Federal law requires that anyone requesting help at an ER be evaluated and stabilised, and around 14 per cent of patients in the ER — the most expensive place to receive medical attention — have no insurance. Care provided to uninsured individuals, whether in or out of the ER, totals more than $50 billion annually. ‘Just that little intervention could possibly save the system hundreds of dollars because he won’t end up in the emergency room,’ said Szilak. Later in the day, we met another volunteer, Eric Sazer, an uninsured filmmaker who was bartering his time at the festival check-in table for doctor visits. On the first day of the festival, a doctor confirmed that the panic attacks he’s been suffering were just that, and not the symptom of some underlying neurological disorder, a worry that had been gnawing at him for some time. He was also worried about his bloodshot eyes, and been given a discount voucher to see an optometrist a few days after the festival. The Patient Protection and Affordable Care Act, which Barack Obama brought into law in March 2010, will change health care provision for people without insurance, but it will be some years before it is fully in place. In the meantime, the festival is one of many ongoing efforts to help artists and musicians get health care. 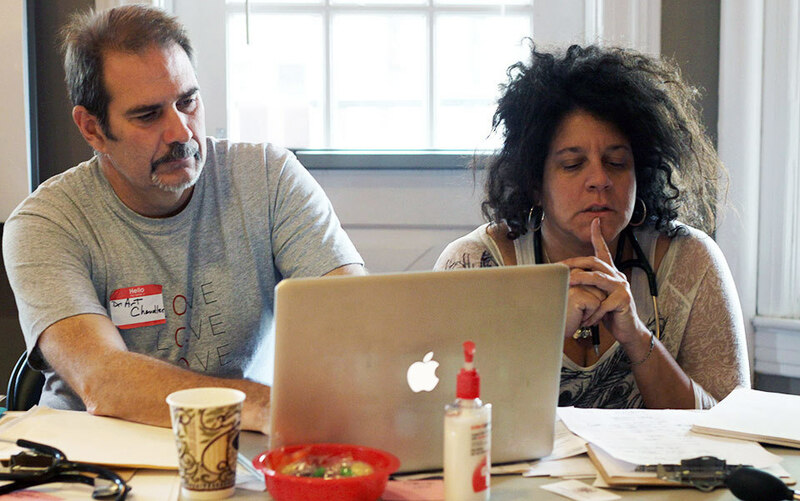 ArtDocs gives medical access to artists in New Orleans and Nashville. Since 2005, the Health Alliance for Austin Musicians has been ensuring that performers there get the care they need without health insurance. Plenty of uninsured people are not musicians or artists and might not have a barter-ready skill or talent. The notion of nannies bartering childcare services for medical attention might seem plausible, but a scenario that encompasses 41 million independent workers, including office temps, restaurant dishwashers, and part-time supermarket cashiers, is hardly within reach. And not all O+ applicants make the cut; performers and artists are selected on the basis of their work, not their medical needs. Dr. Art Chandler and a participant at the O+ Pop-Up Clinic. As Chandler sees it, the underlying problem of US health care is how we think about health in general. ‘Health care is about keeping people well, not just about reacting to an illness,’ he said. He cites the World Health Organisation’s definition of wellness — which includes ‘the fulfilment of one’s role expectations in the family, community, place of worship, workplace and other settings’ — as a good place to start. When all types of attention were included — from general medical care and nursing to psychotherapy, chiropractic work, and alternative modalities — 58 providers worked for a total of 443 hours over the three days of the festival. When discount vouchers for follow-up blood tests, biopsies, and optometrist visits are added, that means that this year’s O+ provided $46,830 worth of health care. Dental and eye care, including follow-up vouchers, came to $22,620 in value. The festival ended with ice cream cake and tearful goodbyes as people returned to the uninsured life. Levin, the Brooklyn-based arts administrator, said she worries about her artist friends with breast cancer, type 1 diabetes, and mental health issues. How will they afford the care they need? ‘We do fund-raisers,’ she said. ‘But I’ve never seen anyone raise very much.’ An artist in even the tightest-knit community would be hard-pressed to barter for the $20,000 needed to treat a tumour. Unlike bloodshot eyes and stained teeth, these illnesses are a matter of life and death. Can the problem of someone not being able to afford life-saving care be addressed at the community level, rather than through broad changes in federal policies? If there is one message that O+ delivers, it is that a community has the power and obligation to care for its people, even the poorest and sickest. In the industrialised country that spends the most on health care but with the least to show for it, that message is hard to ignore. And if it comes with a dose of Ratboy Jr, so much the better.